And I just started the heel on the second yesterday, so a new pair of socks is in my future. If I don’t get distracted by holiday stuff, that is. It is also the time of year that my craft room becomes a wrapping station. I set up the extra folding table and put out boxes, paper, tags and markers, and it makes wrapping gifts so much easier. At least it does when I don’t borrow the table to block my knitting! OMG guys, Christmas is coming. I woke up at 5:30 this morning and for some reason it hit me that Christmas is just a little over a month away and I am so far from being ready that it’s not even funny. I haven’t even had the brainpower to start thinking about it. I have no idea what my kids want, let alone what the nieces and nephews want. I don’t even know what *I* want. (That’s not true. I want yarn and time to knit. That would be plenty.) So there’s a ton of shopping to do, plus decorating, and we have A LOT of decorations. I know, they don’t all need to be put out, but I do love having the house decorated. I’m feeling overwhelmed by it today. I think I got spoiled the last few years, when I wasn’t working and I had time/mental energy to put toward this kind of stuff. It’s a little different now. I have to readjust. I think I’ll make a list. Maybe two lists. That always helps. Let’s try to refocus and think of happier things: I have a FO! I finished my second Color Block Wrap yesterday and wove in the ends this morning and I LOVE it. For as big as this is, it is a super fast knit. It took me about a month, and I am not a monogamous knitter. This was mostly lunch break/ kids’ concerts knitting. Here’s the project page if you want details. I’m so glad I went down a needle size; I love the denser drape. This will get a lot of use this winter. I also have a new cast-on. I had to go to the LYS last weekend to get yarn for an Etsy order, and I knew I was getting some money for a previous custom order, so I splurged on a gorgeous skein of Anzula Cricket in Charcoal. I’ve been wanting a black cowl for myself for a while. It took a bit of searching but I decided on the Saltfleet Cowl pattern, and I’m calling mine the Black Diamond cowl. 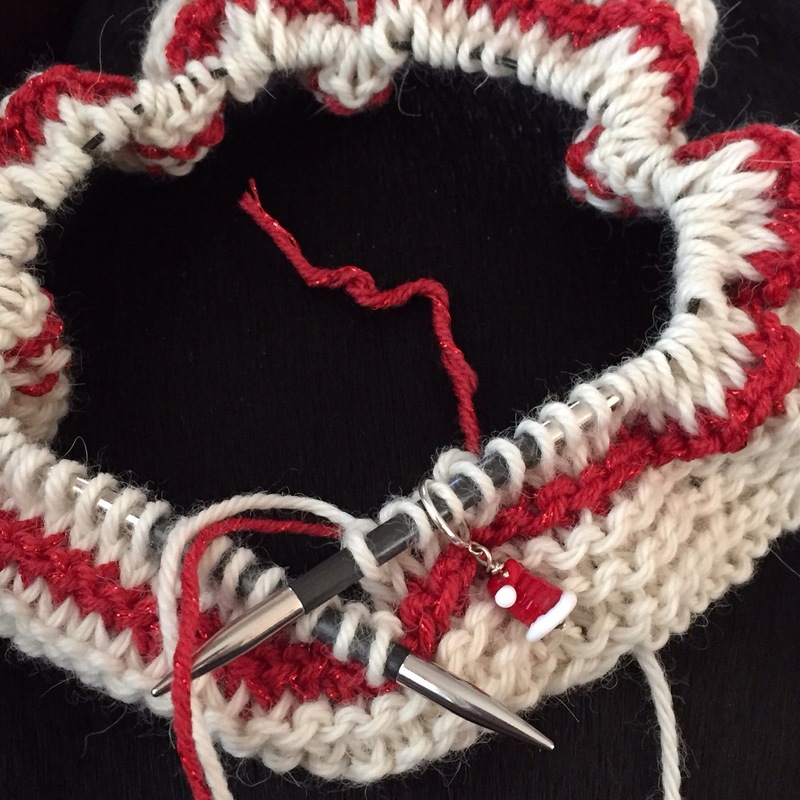 The Anzula is a treat to knit with, that’s for sure. Soft but not limp, not splitty at all, great stitch definition, and there’s enough color variation that it’s not like knitting with black yarn at all. I’m loving this project. And since I finished my previous mindless knitting project (the Color Block), I pulled out a project that’s been in hibernation for a long time. I got the set of gradient purple yarns (Knit Picks Palette) for Christmas two years ago and cast on Purl Soho’s Gradient Cowl. It’s pretty, but boring, so I work on it for a little while and then tuck it away again. I’m now over halfway through, I’m a faster knitter than I was two years ago, and I have a lot more time for mindless knitting. (Unfortunately that means I have much less time for complicated knitting, but hey, it’s a trade-off. I gotta find the silver lining where I can.) Anyway, I took this with me last night when I went to an author event and made good progress. Oh, and I found other knitters there too! 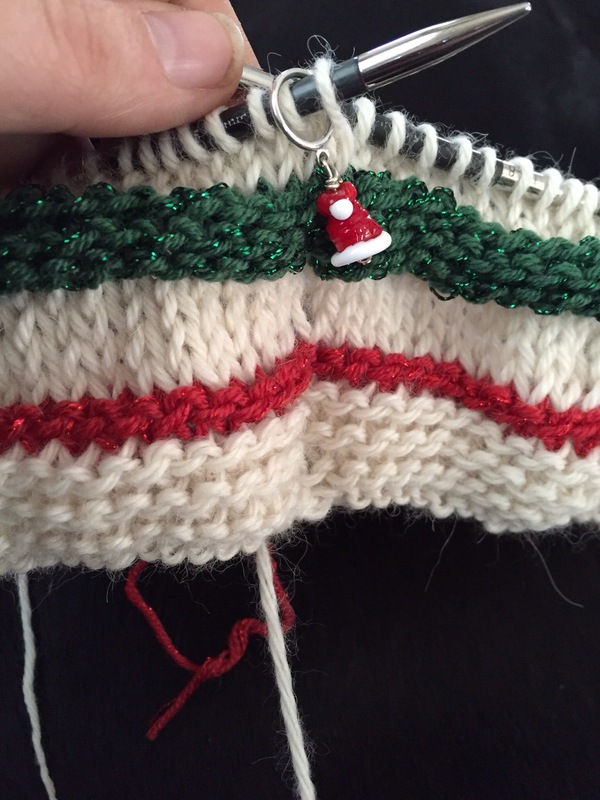 There were two of them sitting right in front of me–I recognized a handknit hat on one, and a handknit shawl on the other. They noticed me knitting during the break, and we chatted a bit, and then during the second half, one of them pulled out her knitting too. I love to encourage knitting in public! Okay, this was a fun interlude but I’m afraid I must re-enter the scary world of holiday prep. We’re hosting Thanksgiving this year so cleaning must happen today, and I’m definitely not doing it all myself so I’ll be dragging some unhappy helpers into the mix. Wish me luck! 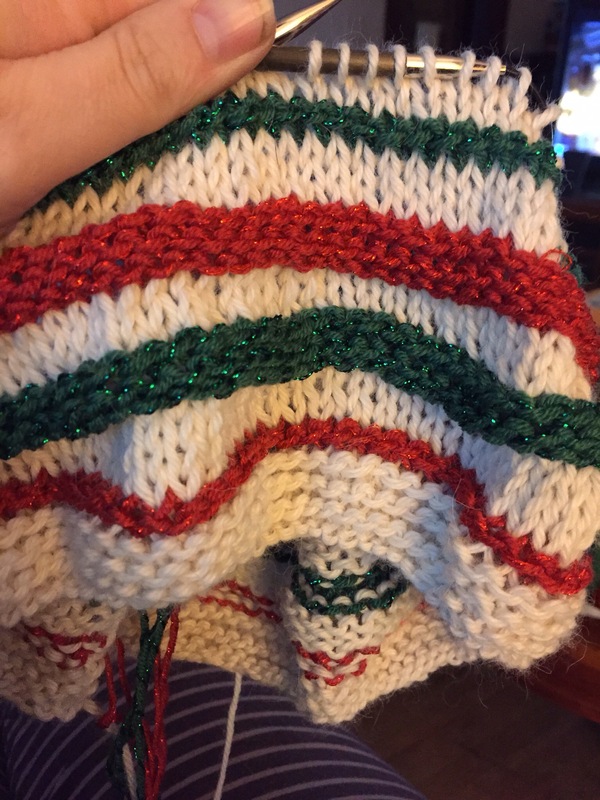 With a short break to wrap some presents with the boy, I worked on my Christmas cowl all day yesterday. I hope to finish it today!